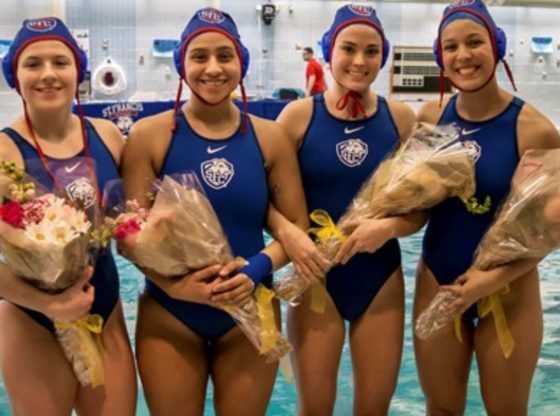 What a weekend it was for the St. Francis Women’s water polo team in MAAC action at SFC Aquatic Center. The Terriers split two games in win-loss fashion in their 12-9 win over Villanova, while later getting ran into the ground as they suffered their 24-9 loss to Wagner on April 7 at SFC Aquatic Center. Nevertheless, the highlight of the Terriers’ weekend came Sunday on Senior Day as the team went on to win both of their matches. The day started out with a 13-9 win over LaSalle College and then ended in a thriller that saw the Terriers knock off VMI in a 9-7 victory. Kelsey Snelgar, one of the Terriers’ key field pieces, made history once again for the books. Against the Wagner Seahawks on Saturday, Snelgar broke her own single-season record of 103 goals with 2 goals against the Seahawks. With the Terriers only having three games left on their schedule, Snelgar already has 114 goals through 25 games on the season; that leads the MAAC. The Terriers will look to churn out a win on the road Saturday, April 13 against Marist. Followed by that day, the team will head out on the road at Villanova to face Siena at 10:30 a.m.